Would anyone suggest that eating a pack of Oreos is a healthy breakfast? No? Would you trust the company that makes Oreos – Nabisco – to make a breakfast biscuit that is nutritious? I ask this question because Belvita is in the supermarket in the same aisle as the Oreos and, frankly, the chocolate version tastes a lot like the chocolate cookie on the outside of an Oreo. The problem is that (even though I slammed this product line in 2012) Belvita is prospering. Do I wish a cookie was a healthy choice for breakfast? Sure! But it isn’t. This is exactly the kind of food – high in processed carbohydrates and sugar, low in fat and protein - that leads to obesity and Type 2 diabetes. I went ahead and called Nabisco (they put their number on the box) and asked them how they could substantiate the claim of four hours of energy. They told me that it takes 4 hours to digest the biscuits because of the whole grains – which is probably true – but it doesn’t mean that there aren’t deleterious effects from the 11 grams of sugar or WHITE FLOUR (the second ingredient in the list). There has to be an energy surge right after eating these that would lead to an energy bonk at some point before lunch. You can add some more fat by adding 50 calories of peanut butter to the top and have a real, satiating and delicious breakfast. But, it will look like breakfast. 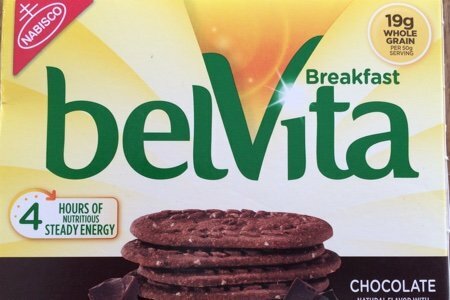 What do you think of Belvita biscuits? Perfect comments on this food Snack Girl. Really? Do people believe this kind of advertising? Or do you think they are eating it for a cookie only? There is so much available nutritional information, it boggles my mind to think someone still would fall for this. I couldn't agree with you more! I have never thought of these cookies as a breakfast substitute. But I have to say, my husband loves them and eats them for breakfast. It is sad to believe that people still fall for this kind of advertising. And unfortunately, several years ago I would have fallen for it because I didn't know what was healthy and what was just being sold to me as healthy food. 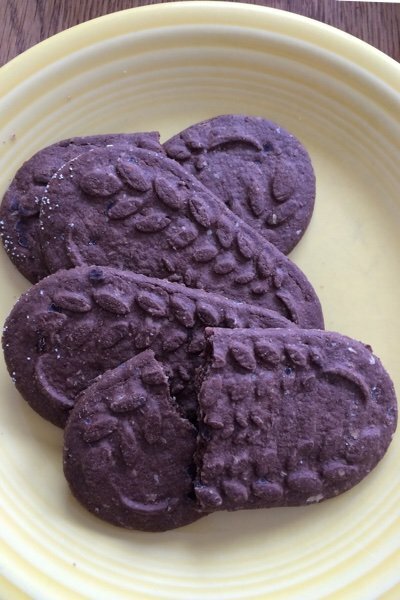 There are plenty of great tasting food out there that you can have that will keep you full and satisfied for breakfast just not a chocolate cookie masked as a quick nutritious breakfast. That IS really tricky packaging...I thought they were "healthy". I have bought these only once- when they were on sale and I was disappointed with them, but I will be sure to never buy them again, ICK. Sadly, people do get fooled by these claims, for instance the patients I serve in my role as a dietitian in a clinic. Those who have little knowledge of nutrition get taken in by the fiber claims, etc. Nineteen grams of fiber is only two-thirds of an ounce. Unfortunately their usual choices are often fast food "breakfast sandwiches," which are surely worse--all that saturated fat and salt. Ugh. 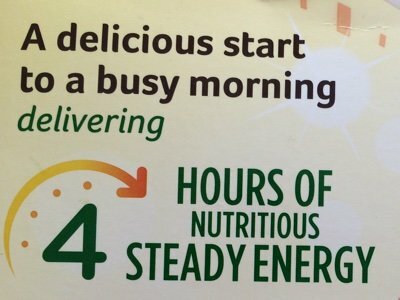 Because it takes 4 hours to digest you have 4 hours of energy? Huh? You can not use the energy until you digest the food. And while you are digesting the food for 4 hours, part of the energy you are getting is divertered to continue digesting the food. I wonder how much actual energy a person gets to use during the digestion process! You nailed this one Snack Girl ! I was thinking who would be duped into buying these based on the box's front label ? In my circle, I can easily see how many of my elderly friends and neighbors would buy these. They like their sweets, they don't have pc's or, the ones that do spend little time on them, and certainly do not do food research, and they have limited income. I have lots of friends in their 60's and older who still don't read labels. Its sad. Thank goodness the younger generation, esp. the moms seem to be more in tune with what to look for in labeling. Thanks for the warning, Snack Girl! For those of us who are nutritionally challenged (a guy), could someone post the guidelines for eating healthy? For example, I look at this and say "whoa, only 230 calories AND it has fiber -- bonus". Obviously, I am in the minority, but I like these cookies! However, I don't eat them for breakfast - I eat them for a snack, and I limit myself to two, not four. I've never had the chocolate flavor, but the cinnamon ones are good. Limit bagged, boxed and canned foods to a minimum of your intake-your body doesn't recognize these as food so it goes into starvation mode. Some canned are ok, beans, tuna, tomatoes but look for BPA-free cans. Enjoy organic whole foods-fruits, vegs, nuts, seeds, fish, and smaller amts of beef and poultry; at a minimum check out top dirty 15 plant foods and insist all animal products are organic [yogurt, milk, meats]. As much as possible, make your food home-made. Research, research, research! items you eat regularly --its not the occasional food you eat that's no good for you --its what you eat 90% of the time. This includes reading labels. Cookies for breakfast.......Hmmmmm! I like the idea of that but just don't think that it could ever be a good idea. How long does it take to put a piece of bread in the toaster and put some PB on it!! Whenever the "next" new thing comes out like that I do look at the ingredients and nutritional breakdown. I am amazed what stuff they try to pass off as food. While it's good to know what is healthy, I think you should eat what you enjoy sometimes even a bit of sugar. My husband always ate very healthy, exercised daily, didn't smoke, but was diagnosed with incurable cancer, so eating healthy is no guarantee. My parents ate what they liked, including sugar, and lived to their 90s. Like others here say - I give these as an after school snack to avoid crazy kids in the back seat. But I would never think it was a meal replacement. I have to say the orange and cranberry one is delicious, my kids like the cinnamon. And our stores usually have them in the breakfast or snacks aisles. I have never found them next to cookies, but they probably should be there. I keep some in the car in case of emergency. I have found them satisfying longer than other foods I can keep in the frozen car. I also give them to an active friend who uses them for her long distance horse rides as an easy snack. I don't like the chocolate ones. Most of these biscuits and granola bars and such should all be in the cookie aisle. Not sure how a store decides that pop tarts and these go in a different area.